A semi-enclosed deck area is the focal point of this inner city appartment – 2 sides open from the living and dining areas of the apartment. 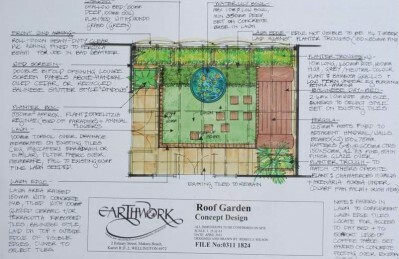 The client wanted a lush, sheltered garden ”escape” in the Balinese style, quite a challenge for a top-storey apartment in Wellington! Also she was determined to have a lawn – and she now has one, all of 4 m2… this tiny but valuable carpet of green is the centrepiece for this little garden and is raised to allow soil beneath. A roofed pergola helps create a hot-house environment and the planters and climbing plants over the pergola and screens provide lush surroundings complemented by the Balinese Daybed along one side. Extra shelter is available if needed with roll-down PVC screens from the pergola beam, but with the roofed pergola and the permanent climbing screens at each end it is hoped this is not really needed.